Lynchy , you ain't at one of Sydney gay bars again?? Oh ,I've run outa Crownies too. you ain't at one of Sydney gay bars again?? Nah - not happy enough - not that there's anything wrong with that! Oh ,I've run outa Crownies too. but then you'd probably put it in the bus and bring it down to SA as a push car!!!! Oh yeah, Welcome to the club rogue666! There is another RX7 chappy (well, a redhead) who already has done some hard yards at getting a 13b to speed. Should be good to give him some competition. Thank you Mr Hedgash for the warm welcome. To answer Bob, my car is standard on the outside and runs a very close to standard 12A. So I'd think E/GT would be the class and that record stands at 146MPH presumably by the other rice cooker driver. I just want to run out 5th without getting a ticket and having my car crushed by the good chaps keeping the peace. rogue666 wrote: I just want to run out 5th without getting a ticket and having my car crushed by the good chaps keeping the peace. Here's the current E/GT record holder, '82 RX. 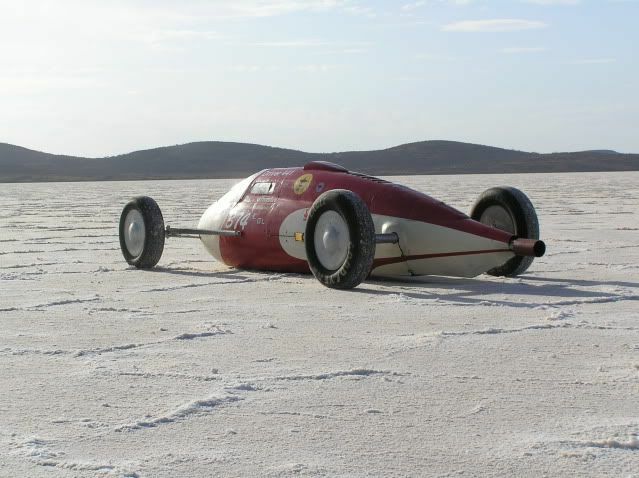 I met someone at a DLRA meeting at Norm's in Melbourne last year who was involved with a team racing a mazda and were interested in taking it to the salt. Miliatary man. Been to Afganistan. A little off topic I know but.... some time after I met the good wife, a mate and I were trying to explain to her the sound of a hot rotary. She wouldn't cop it as gospel and was sure we were giving her a rev. As luck would have it we went to one of the early summer nats, pulled into a servo with our respective vehicles so the girls could use the "facilities". Right after they've gone to the green room a red hot RX4 turns up and the driver goes inside for whatever he wanted. I set it up with the mate that when the girls get back we're going to wait for the captain rotor to come out and fire up. The girls came back and after a minute start asking what we're waiting for. "You'll see" was all they got back. A couple of minutes later, Mr RX4 comes back and fires up the angry mozzie. The look on the missus' face was priceless. Damn good laugh all 'round at her expense. Mate that yellow thing that ran out here had an 8 foot megaphone and no muffler. I loved it simply because it broke all the rules. Oh sorry for my rudeness, welcome Mr 666. We don't discriminate here, we accept all race, colour and bad taste. C Hanlon wrote: Oh sorry for my rudeness, welcome Mr 666.
yes and blokes that stupidily put holden engine's in to some of Henry's finest work too !!!!!! I've owned far too many Fords over the years but only one Holden. It was the worst three days of my life! Now it's Toyotas thanks very much. One of these years I'll get back on with the Celica. Just after Trevor's car is done and I come into some money. C Hanlon wrote: Mate that yellow thing that ran out here had an 8 foot megaphone and no muffler. I loved it simply because it broke all the rules. Apparently it's note is finely "tuned" for this year, whatever that means (I'm bringing workshop ear protection). The megaphone is still there, no snow shovel out the front, and Dave's refined his driving skills working on the public Busses this year. If someone hasn't heard the sound there is very little you can do to convince them how such a little engine can produce such a sound is amazing. The Bonneville video was very worrying, but a 1000bhp RX7 was always going to be a bit of a worry. The same car was repaired and went onto to 242MPH. I just love the fact that my 22 year old standard 12A will pull 8000rpm whenever I ask it to.